Lately, rich domestic craft brews studded with spice have spoiled my taste for the mass-market Canadian stuff I usually like. 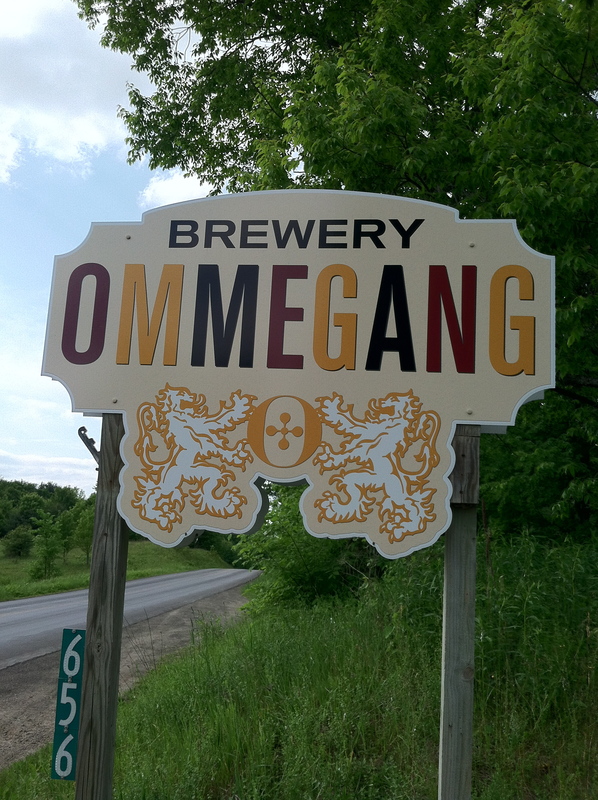 A pricey treat when bought in the Hudson Valley where I live (3-4 hours southeast), Brewery Ommegang in Cooperstown, NY, makes Belgian-style ales that are surprisingly affordable, not only at the brewery’s café but in town as well. Recently I traveled to Cooperstown for the first time, a place perhaps best known for the Baseball Hall of Fame. I thought I should stop by, since I was there anyway, but as baseball is not my favorite sport (although I confess I have a soft spot for the Mets), I came up with excuses not to go ($20 a ticket, hungry cats waiting at home, that sort of thing). Even without a visit to The Hall, I found Cooperstown a charming village set on a splendid lake, well worth the trip. 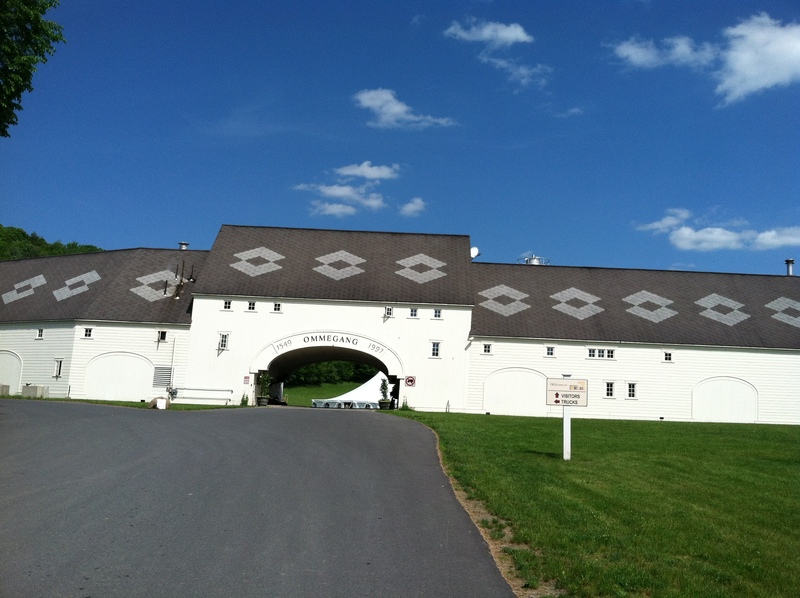 A late afternoon arrival at the Ommegang Brewery (caveat: the website is graphically pleasing but hard to navigate), set amidst fields a few miles out of town, meant a lupper (or is it linner?) for hungry bellies. Too late for a tour, my friend and I settled for a feast on the sunny but bare-bones patio outside the brewery’s café, and soon went from starving to stuffed. And happily quenched as well, thanks to some Ommegang Abbey Ale, BPA (Belgian Pale Ale), and Three Philosophers. The brewery, as one approaches. “In most restaurants a $6 glass of wine is vinegar, but a $6 beer is world class,” say the Ommegangers on their website, and it’s true. The brewers seem to be continually at work on discovering all the delightfully different ways that quality beer can go with food or be cooked into it. We started with sumptuous hand-cut frites, a la Belgique, in a tall cone, perfectly double-fried and irresistible. There is a choice of seven dips, some with beer added; we picked garlic aïoli and truffle-soy aïoli, both luscious. 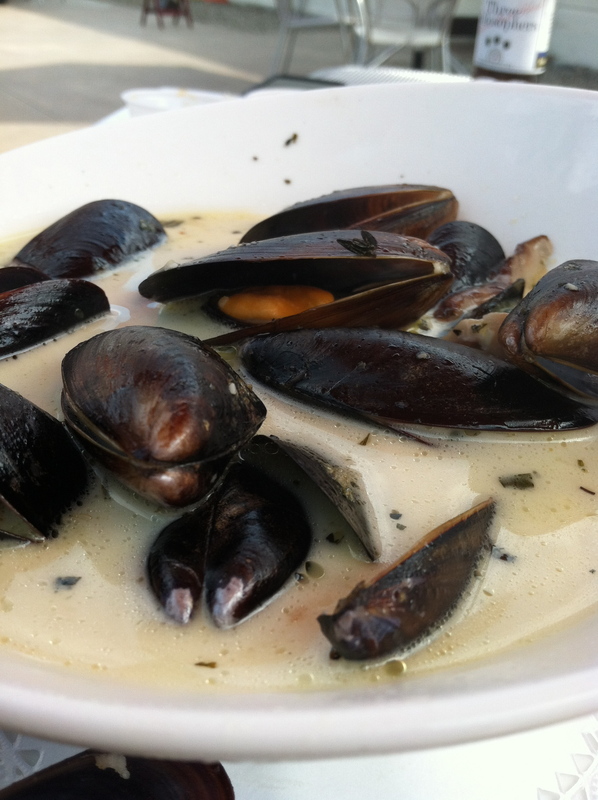 But better still were Moules Witte, mussels swimming in a heady mix of Witte Ale (wheat, coriander, orange peel) with cream and shiitake tidbits. We also indulged in crab croquettes and finally a charcuterie platter that arrived last, when we were full, but was too delightful–in look and taste–to skip. 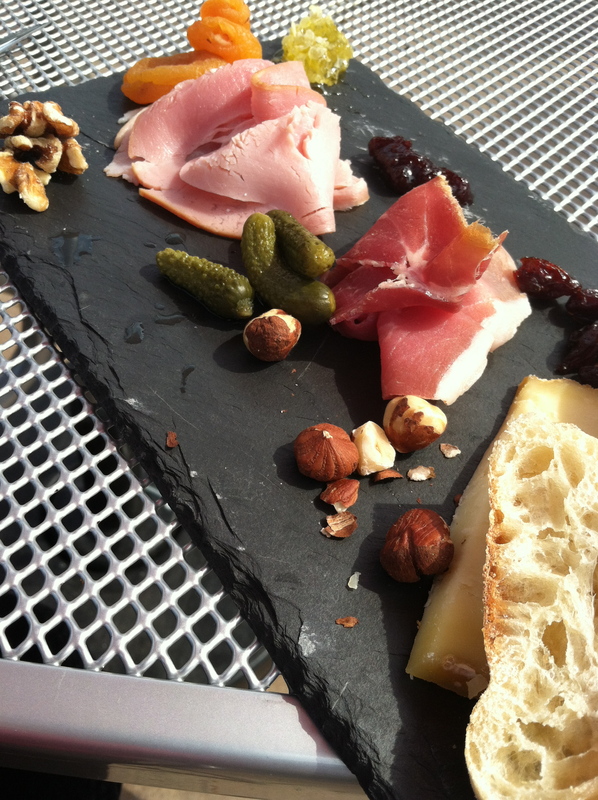 A custom charcuterie platter: (back to front) walnuts, dried apricots, honey on the comb, jambon de Paris, a luscious berry jam of unknown provenance, cornichons, prosciutto di Parma, craisins, hazelnuts, Tilsit, and crusty bread. Also on offer are salads, sandwiches, waffles, sweet and savory crepes, and best of all, affordable Ommegang on tap. 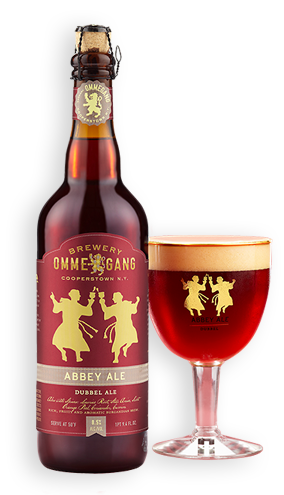 My favorite is the Abbey Ale, Ommegang’s first: dark ruby, rich, and fruity yet dry. The BPA is a pale ale with citrus notes, nice but it just pales (pun intended) next to the Abbey. Ommegang also makes Rare Vos, an amber ale I have yet to try, Hennepin, a gingery golden ale (okay), that wheat Witte, and Three Philosophers (another favorite: dark, strong, malty and cherry-tinged due to the addition of 2% Belgian kriek), plus limited edition ales. At the cafe many Belgian imports are available, too, as well as three-beer flights for the indecisive. I would have loved to save room for the ice cream made with Three Philosophers, but was, alas, too stuffed. There’s always next time…. I can’t wait to go back. Stay tuned for a report on Keegan Ales in Kingston, Ulster County, at this site after June 22, 2012.